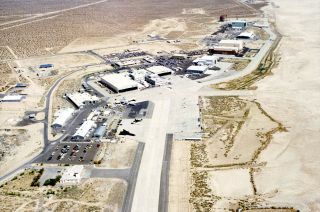 Aerial view of NASA's Dryden Flight Research Facility, which the U.S. House of Representatives has voted to rename after the late moonwalker Neil Armstrong. The U.S. House of Representatives has voted to rename a NASA flight research center after the late Neil Armstrong, the first man to walk on the moon. The resolution, which late Monday (Feb. 25) was approved unanimously in the House, calls for NASA's Dryden Flight Research Center in southern California to be renamed the Neil A. Armstrong Flight Research Center. The bill (H.R. 667) also renames the surrounding Western Aeronautical Test Range after Hugh L. Dryden to continue honoring the aeronautical engineer. "Not many people know the relationship between these two men," said Congressman Lamar Smith (R-Texas), the chairman of the House Science, Space, and Technology Committee. "Dryden was the visionary behind NASA's X-15 rocket plane and the Apollo program. Neil Armstrong was the one who flew the spacecraft Dryden envisioned." This is at least the third time since 2007 that the House of Representatives has tried to rename the NASA center after Armstrong. The famed Apollo 11 commander died last year. With the bill now passed in the House, it will be referred on to the Senate for consideration. "Dryden recommended to President John F. Kennedy that the goal of putting a man on the moon within 10 years was achievable and something the American people could rally behind," Smith said. "The rest is history. President Kennedy grabbed Hugh Dryden's idea and addressed a joint session of Congress the very next month. The Apollo program was the brainchild of Hugh Dryden." Neil Armstrong, flying with his Apollo 11 crewmates Buzz Aldrin and Michael Collins, accomplished Kennedy's goal of landing on the moon. On July 20, 1969, Armstrong and Aldrin touched down at Tranquility Base, where Armstrong became the first man to step foot on the lunar surface. Armstrong died Aug. 25 at age 82 following complications resulting from cardiovascular procedures. "Neil Armstrong turned [the] dream into reality by making that 'one small step for a man, one giant leap for mankind' on another world almost 240,000 miles away," Smith said. Research pilot Neil Armstrong stands with an X-15 rocketplane at NASA's Flight Research Center, Edwards, Calif., in 1960. "Dryden was not able to see his dream become reality, as he died in 1965," Smith continued. "And unfortunately, Neil Armstrong passed away last August. It is important for us to honor both men's legacies by naming the Flight Research Center after Neil Armstrong and the surrounding Test Range after Hugh Dryden." The Dryden Flight Research Center is NASA's primary center for atmospheric flight research and operations. In addition to its research work to advance the design of civilian and military aircraft, Dryden was the primary alternate landing site for the space shuttleand is now managing the launch abort systems testing and integration for NASA's Orion crew module, its next-generation multi-purpose spacecraft. From 1955 to 1962, Armstrong served as a test pilot at the center (then the High-Speed Flight Station), amassing 2,400 hours of flying time, including flying the X-15. While still at the center in the early 1960's, Armstrong was part of a team that conceptualized the Lunar Landing Research Vehicle, which helped create the training vehicle that he and other Apollo astronauts used to practice landing on the moon. "In some respects, I think Neil might have been a happier man if he had stayed a test pilot, becoming chief test pilot at NASA Dryden," historian James Hansen, the author of Armstrong's 2005 authorized biography "First Man," wrote on Facebook. "His career in test flying will be remembered even more now that his name will be forever associated with the Flight Research Center." "It is also nice that Dr. Dryden's name will remain attached to the facility," Hansen said.